The latest stable Flatpaks of 8tracks, Bandcamp, and Google Play Music were updated to use Chromium-based backend for music playback without Flash plugin. 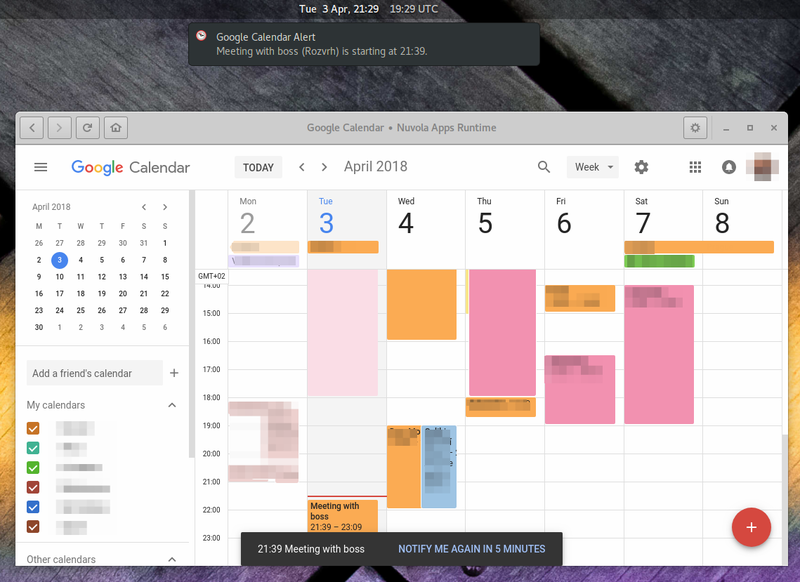 Google Calendar also uses Chromium engine for better performance and desktop notifications instead of web app alerts. To install Nuvola, follow installation instructions at the Nuvola Apps Repository Index. To update Nuvola, run flatpak update --system && flatpak update --user in terminal (as a regular user, not root/sudo) or use a package manager which supports Flatpak (e.g., a recent GNOME Software application with the Flatpak plugin). This blog post applies to the genuine flatpak builds of Nuvola. If you use a third-party build, contact your distributor to find out which features are available. The 4.10.x development cycle focuses on tweaking & polishing rather than on new features. Scripts are being ported to Chromium backend receiving integration improvements, documentation is being updated, bugs fixed, etc. The Chromium engine was updated to 65.0.3325.146. The password manager was removed because it works only with the WebKitGTK engine and the current implementation causes build errors with Vala 0.40. A new version will be developed for Chromium engine. Chromium backend supports URL filtering to open external links in a default web browser instead of in Nuvola window. It is also more reliable than in the case of the WebKitGTK backend, which has trouble to recognize external links in Google Calendar. Web app alert messages use beautiful in-app notifications instead of ugly dialogs. 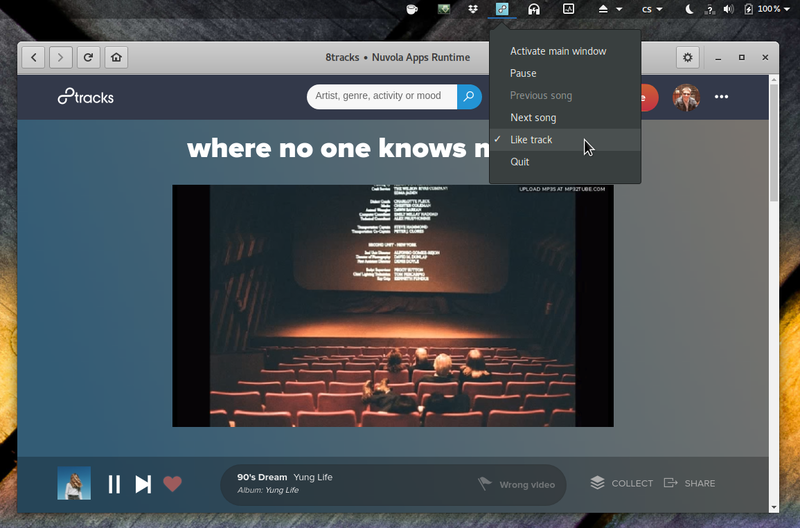 Nuvola uses in-app notifications for web app alert messages. 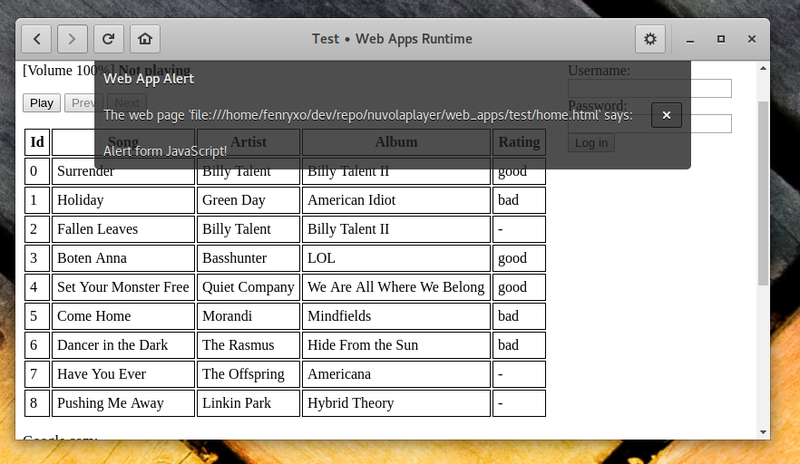 It switched to Chromium backend for music playback without Flash plugin. The extraction of metadata was adjusted to recent changes in the web user interface. The Like track action has been integrated (e.g., you can use it in tray icons or assign a keyboard shortcut). The Like track action is now integrated. Track position and length is integrated. Progress bar is now integrated. 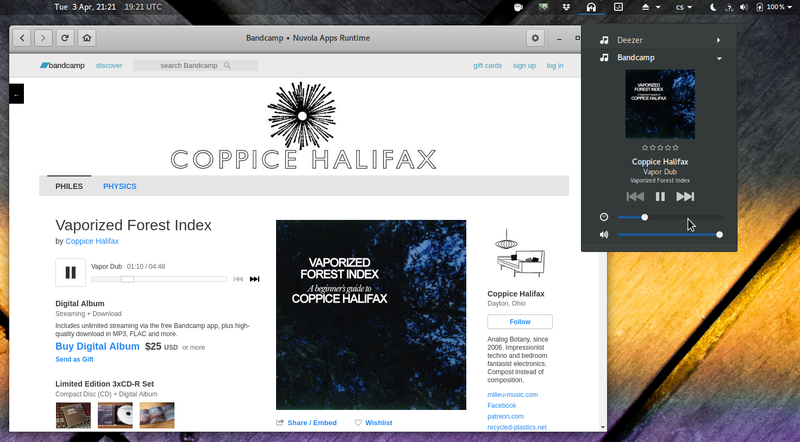 It switched to Chromium backend for better performance. If desktop notifications are enabled, they are used instead of web app alerts. 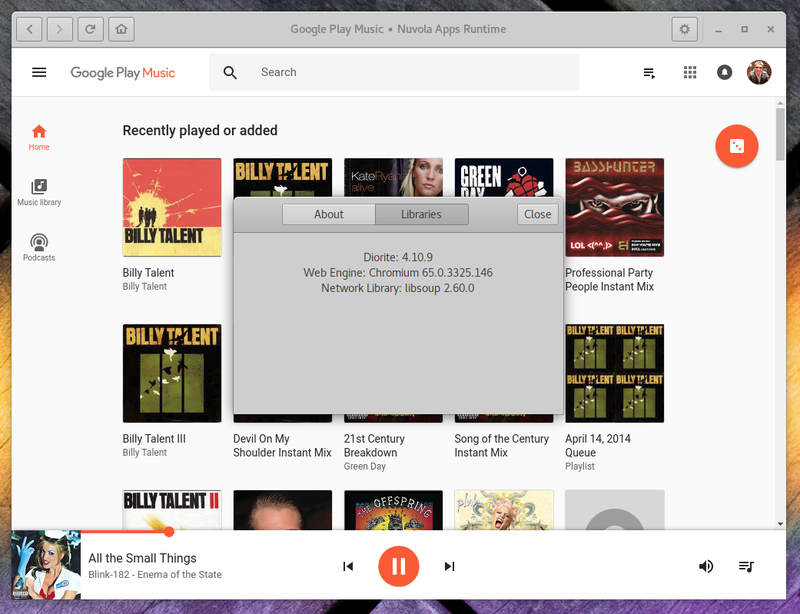 Google Play Music plays without Flash in Chromium engine. Jiri Janousek, the core developer of Nuvola Apps project, is glad to contribute a part of the project’s revenue to the Good Angel foundation. This way, he can regularly help families with children, which face financial distress as a result of severe illness. Even small monetary donations can help these families overcome a tough period. Nuvola contributes to Good Angel Foundation. At the time of writing, the awesome people listed bellow and a few others are Nuvola Patrons, who support the development of Nuvola Apps Runtime. Thank you all! Christian Dannie Storgaard, José Antonio Rey, Ryan Wagner, Simon Law, Bart Libert, Chris Beeley,Andrew Azores, Bryan Wyatt, Balázs, Denton Davenport, Ben MacLeod, Duco van Amstel, David Wiczer, Andrew Allen, Nathan Warkentin, Chuck Talk. If you are a Nuvola Patron but your name is not listed, you have to enable the “Show my name and a link to my external profile page in a list of Patrons.” option in your profile settings. Obviously, it is not enabled by default to protect privacy of our patrons. Retiring chemist, emerging software developer, GNU/Linux lover, European citizen. News from the Nuvola Apps project.